What is the best method to start an emergency hospital tank? How do you avoid the cycle? I think this info could be really helpful to newbies or even intermediates. I just fill a tank with fresh saltwater, add an airstone, heater, thermometer, and a PVC elbow. 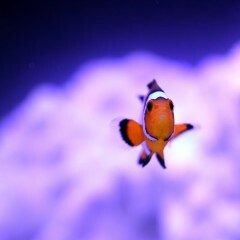 To control ammonia, I dose seachem prime daily, do frequent water changes, and feed light. Will the prime effect medications or vice versa? It will affect cupramine. Cupramine + prime = dead fish. Another way is to be proactive and leave say a non-running sponge filter in your DT or sump. Or you can leave rubbles or ceramic rings in a HOB filter and move them over into your QT filter. I keep a small amount of bio media in my media area, some fluval ceramic ring things they sell for aqua clears in the event I need to set up a tank in an emergency. +1, except I don't use Prime, I just do really frequent water changes and test ammonia often, like daily. Also I have a HOB with a filter in it, but no carbon. Great. Thats very helpful in the event anyone ever needs to set one up! Instead of making a whole another tank, you can get a piece of plexiglass that fits the width of your tank and seperate your tank in 2. Get another power head for oxygen and just use the tank,rocks,water,and corals that you already have. That would only work if the issue was an unmedicated injury or fighting fish. For any medication, obeservation before being released in the tank, etc you need a separate tank. But if you do my plan correctly, that won't be necessary. Chances are the seal won't be perfect and you'll have leak from one compartment to another. You'd have to silicone it to ensure no leaks. It seems like a lot of work with large risk. much easier to just build a separate tabk, plus you would be reducing territory for the other fish. Yes, but there is underwater sealing glue that won't harm the fish. It costs less though with my plan. Did you think of that? No it doesnt cost less because you are disrupting the display tank and under water sealing glue would permanently disrupt your display tank. At best youre saving $15 while damaging your display tabk and disrupting and stressing your residents which also can cause loss of fish and corals who werent sick to begin with. I forgot that it would do that to the beauty of the tank. You make some solid points. We should talk later some time. Not just that but since you would be medicating one side of the tank, how do you ever use it as 1 full dt ever again? No, because you can't have medication in the DT. It can kill the entire system. You cant remove it without draining it 100% and scrubbing. Once again, the idea would only work in the event of fighting fish and even then, a breeder box or removal from the tank is a more practical solution. The plexiglass idea is neither good nor practical. Haven't had many tanks have you? A medicated QT tank is absolutely necessary when introducing fish to a display tank. OP - I keep a sheet of poly floss in my sump. It has tons of live bacteria and when necessary I can pull my QT out of storage and put the floss in a filter and have the tank up and running in 20 minutes. aqua clear filter with everything removed. I do a 3 gallon water change every 3 or so days. I do a dose of Prazipro after a week, but that's all. The fish I bring home will have been in a copper system for a month prior...and I keep them in this setup here for 6-7 weeks. A wise choice? Sure, but absolutely necessary may be stretching it. Especially given that the vast majority of reefers don't do it (not that they shouldn't, just that they don't). And that just goes for QT, preventative medicating is a whole other can of worms..
solid point, but you can just seal off the sick fish into their own little cubes with plexiglass and aquarium glue...did you think of that?